We love this pen. We love this stylus. We love this flashlight. Yes, we can say all 3! 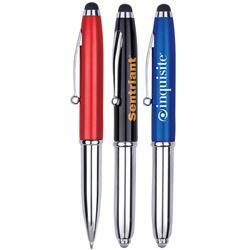 A 3-in-1 stylus metal ballpoint pen & LED flashlight with your custom logo engraved. A unique promotional item that will be used for years to come. The stylus can be used with iPhones, iPads, touchscreen devices and tablets. 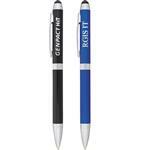 This is a must see stylus ballpoint pen! Available Colors: Blue, Red or Black with Silver Trim. Production Times Available: Standard 5 to 7 working days with a paper proof. Dimensions: H 4 7/16 x W 5/8 x D 7/16"
Typical Imprint Area(s): Silkscreen: H 1/2 x W 1 1/2", Laser Engraving: H 1/4 x W 1 1/2"
Available Imprint Options: Silkscreen or Laser Engraving. Metal, Stylus, Ballpoint Pen, LED Flashlight.